Diablo III could be released next month which aligns with Blizzard’s proposed launch window of Q2 2012 for the highly-anticipated title. A report from mmorpgitalia (Italian) claims that Activision Italy has informed retailers in the region that the game will be release on April 17, prompting some stores to put out pre-order boxes. Amazon.it was one such retailer that initially ran with the April 17 release date but as of writing, it’s been changed to the much less specific ‘2012’. Game director for Blizzard Jay Wilson has been fielding questions regarding the rumored date on Twitter. When asked if he could confirm or deny the date, he tweeted that he “cannot debunk or confirm” the proposed release date, adding fuel to the fire rather than dousing it before it spread further. 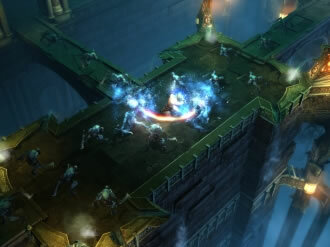 Diablo III has garnered extensive media attention over the past several months in reference to when the game might launch. Blizzard started a closed beta for the game in September 2011 with many hoping the title would be released in time for the lucrative holiday buying season. Blizzard, however, has remained steadfast in not releasing an exact date, rather stating that the game will be ready when it’s ready. Wilson did leave us with one more tidbit via Twitter. @ChrisFW asked the game director to comment on how close an announcement is on a scale of 1 to 10 with 1 being not even close and 10 being imminent. Wilson replied with a 9.